I’ve been thinking quite a bit about size lately. Not as in personal dimensions – although that’s obviously been a feature of my recent writing; no, I’m referring to books. Doorstoppers in particular. 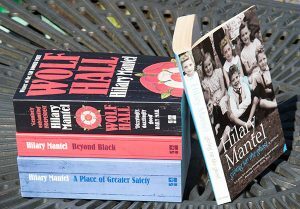 Take Hilary Mantel‘s huge tomes for example – excepting her memoir Giving up the Ghost which I sped through in a couple of sittings. Wolf Hall and A Place of Greater Safety have been staring at me reproachfully from my shelves for ages, but I can’t quite bring myself to set aside a large enough block of time to plough through them. I’m not one of these razor sharp people who can have several books on the go at any one time and so afford to have a massive volume on the bedside table to dip into over many months whilst steaming through an alternative pile of quick-reads. I lose track of characters and story-lines far too easily. And books which impinge directly on my own area of expertise/current writing tend always to take precedence. 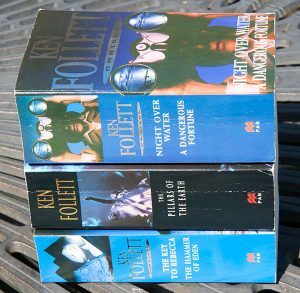 Ken Follett‘s sprawling tales – each of these is two inches thick! – are another example from my library. I loved his The Third Twin which I read aeons ago, so I bought these three on the strength of that recommendation. They’ve remained unopened to date. Same reasons. Likewise Penny Vincenzi and … but I won’t bore you with a list. 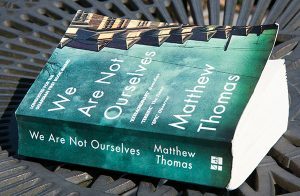 An exception though, has been Matthew Thomas‘ debut novel, We Are Not Ourselves. (An inch and a half thick, if you’re interested.) For purely pragmatic reasons it rose instantly to the top of my pile: it’s in my ball park and a friend gave it to me for that reason; but I feel a degree of urgency to read and return it because I know her husband is next in line for it. So I’ve persevered doggedly to the bitter end and not allowed myself to be deflected. It’s a sprawling tale about the Leary family spanning sixty years, tracking a college professor’s descent into Alzheimer’s and the effect on his wife and only son. It even has a chapter where the son is rehearsing for a debate on euthanasia! So yes indeedy, my kind of subject. But really! Does any fiction merit 620 pages of tiny text? It took Thomas ten years to write (in a one bedroom apartment with young twins); my own (impertinent?) judgement is he’d have been well advised to edit it severely and give the story more zing and pace. 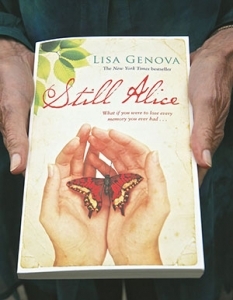 Comparisons can be odious but Lisa Genova‘s Still Alice accomplishes more in far less time and space. It’s the massive annual Christian Aid Book Sale in George Street this month, so I’ve decided two things: to bequeath all my unread Follett novels to the cause (along with a boxful of others); and to resolutely set my face against buying more books until I’ve cleared some from my shelves. Snag is, most of the ones still jostling for attention I’m sure I shall love too much to part with even once I’ve read them. You’ve probably heard of Lisa Genova. She’s a neuroscientist by background but now also a fantastic novelist. Her debut novel, Still Alice – a fascinating insight into the mind of a young professor with Alzheimer’s – became a sensation and was made into an Academy Award-winning film in 2014. I gave it a four star rating when I reviewed it on my blog and when I chose it for discussion at a Readers’ Day. A brilliant and perceptive book. 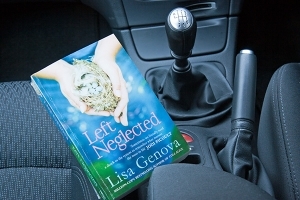 Less well known is Genova’s second book, Left Neglected, which I also reviewed on this blog some time ago while I was ill. I loved this one too and it resonated with my own experiences of identity and disability. It’s insightful and lyrical and thought-provoking. 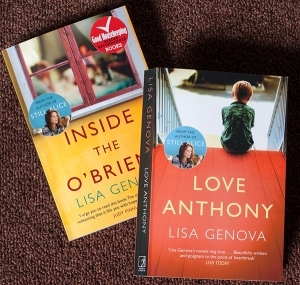 So I just had to buy her other novels: Love Anthony and Inside the O’Briens. I’ve now read both of them but come to different conclusions about them. This week I want to talk about Love Anthony. It tells the story of two women: Olivia and Beth. Both have disintegrating family lives; both are left without husbands; both adopt new careers. Olivia Donatelli’s dreams are shattered when her beautiful little boy Anthony fails to develop normally, fails to speak, fails to engage with her emotionally. 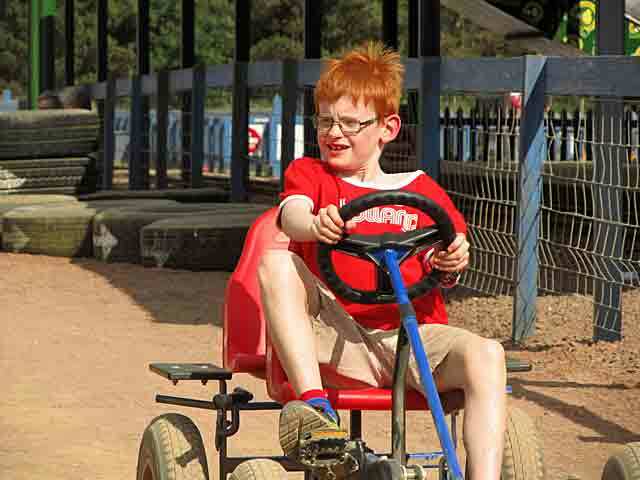 Aged 3 he is diagnosed with autism. Aged 8 he is dead. The strain and toll wreck her marriage and deplete all her reserves and resources. She buries herself in remote Nantucket Island until, through her photography, she finds new direction and new answers. Beth Ellis is the mother of three girls who has just discovered her husband’s infidelity. Struggling to find a new identity she turns to creative writing and begins to write a first person story about a boy with autism. Sitting in the same seat in the same library she feels she is somehow channelling a haunting voice. Oh dear. I’m afraid this book didn’t live up to my expectations. Neither the writing nor the plot nor the characters are a patch on Still Alice. It doesn’t do for autism what Alice did for Alzheimer’s. And I really didn’t like or believe in the story Beth wrote – the narrative voice became tedious and improbable. So I was startled to read Genova’s own declaration: ‘With Still Alice and Left Neglected, I was a neuroscientist writing a novel. 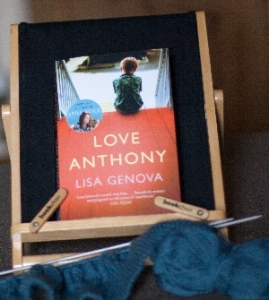 With Love Anthony, I became a novelist.’ Hmmm, is there a cautionary tale there for me? Tune in next week for much better news about the other one, Inside the O’Briens. Isn’t it weird how things you read so often resonate with real life? They seem to jump off the pages. Some of it’s serendipity, some of it presumably just because we’re preoccupied at some level with a particular facet of life, making us super-sensitive to any mention of it anywhere it crops up. That’s how it was with Lisa Genova‘s Left Neglected for me. (Clever title, by the way.) After a set back with my own ongoing health problems this past week, my upbeat facade slipped a bit; despondency crept round the edges of my guard. Sigh. Would I ever get back to full capacity and pick up the strands of my previous working life? OK, distraction required urgently. Tidy desk … light a scented candle … reach for the next book on my tbr pile. And there it was: Left Neglected. 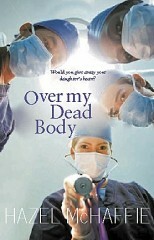 The protagonist Sarah, a young mum of three, brain damaged in a car accident, is struggling with a crisis of confidence. Will she ever get back into her high powered, multi-tasking, crowded, demanding life again? And boy, this woman has far, far bigger mountains to climb than I; much, much further to fall. Already my own task assumes less daunting dimensions. awareness of our own powerlessness: ‘The therapy might work and it might not. I can work as hard as I’ve always worked at everything I’ve ever done, and it might not be any more effective that just lying here and praying’. ‘Lucy comes out of her bedroom dressed like a lunatic. She’s wearing a pink and white polka-dot vest layered over an orange long-sleeve shirt, velvet leopard print leggings under a sheer pink ballerina tutu, Ugg boots, and six clips secured randomly in her hair, all different colors. By the time we get to page 75 we’re not surprised that she’s searching for her phone while she drives from A to B and momentarily takes her eye off the road. We might even secretly sympathise. How else will she stay on top? Ahhh. Speed limits. I too have been evaluating mine. Must I also accept that ‘life can be fully lived with less’? In her acknowledgements Lisa Genova thanks all the people actually coping with Left Neglect who shared their experiences with her, giving her ‘the real and human insight into the condition that simply can’t be found in textbooks’. And this human warmth is what makes the novel so much more than the anatomy of an illness. So I salute you, Lisa Genova. And I thank you for putting my own problems into a healthier perspective. 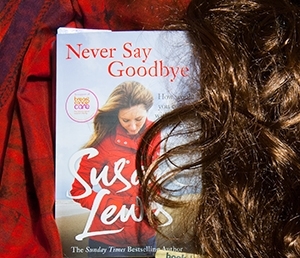 The next novel in my pile, Never Say Goodbye by Susan Lewis, takes me deep into the lives of women with incurable cancer … Ahhhhh. By now I’m deeply ashamed of ever having felt a twinge of self-pity. I’ve since patrolled the Infirmary corridors in a torn and skimpy hospital gown (guaranteed to rob you of any sense of power or control you might be clinging to!) waiting for a medical verdict. My turn comes. I learn that a doctrine of doctors with yards of erudite letters after their names and aeons of experience with hearts of all descriptions, have put their mighty heads together to devise a plan to set me back on the road to recovery. It will take some months but I may not … may not … after all have to give up what I love doing. Thank you thank you thank you. The NHS at its amazing best. I may be dizzy and nauseated and fuzzy-headed and more tired than I’ve even been in my life, but I’m back on top of the world! Two things to report this week: both related to author appearances. The first was a salutary lesson to me. I discovered quite by chance, and after the event, that a reporter had slipped incognito into one of the sessions I was doing and published a lengthy report of it! Phew. Had I known, I’d have been super-conscious of what I was saying, but I had no idea. I thought I was talking unscripted to a lovely group of book lovers in a public library on a beautiful sunny Wednesday evening about my latest novel and the issues it raises. They all seemed fully engaged with what I was talking about, and asked some very relevant questions. I simply responded to these and their non-verbal cues. So it was a bit of a shock to find a pretty full account of what we’d talked about in The Edinburgh Reporter! A few comments have been given an emphasis or slant that I certainly didn’t intend, and hope I didn’t say quite like that, but hey, I’m impressed that the reporter gave our quite low key event so much space. Then, this past weekend, I was one of four authors invited to take part in a Readers’ Day in North Ayrshire. We were each asked to select two books – one of our own and one other – to discuss in workshops. My choice was Still Alice by Lisa Genova, a brilliant novel about Alice Howland, a Harvard Professor of Neurolinguistics, who gradually loses her sense of self through Early Onset Alzheimer’s Disease when she’s in her late 40s. Why did I chose this? Because it’s a brilliant book which takes you inside the skin of this character and her condition. Because I work with people with dementia, so it’s a topic near to my heart. Because I’ve written on the subject myself (Remember Remember). Because I love a book that challenges me to think about important issues. Because I personally identify in many ways with both the author and her principal character, Alice. Enough reasons for my choice, huh? By chance, dementia has been making headline news again this week too, so I felt it was doubly appropriate … not that the issue is going to go away any day soon, of course. As we get better and better at curing illnesses, and health and life-expectancy improve, so the number of people contracting this particular set of diseases which affect the brain, memory and behaviour, grows. However, it’s a sobering fact that global spending in this area is five times below the level allocated to the field of cancer. It’s also a fact that many people now fear getting dementia more than they dread a diagnosis of cancer. You’ll probably remember that last December, the G8 summit advocated a concerted global attempt to combat this growing scourge – in a nutshell, more spending and better coordination in order to find effective treatments. Common sense really. They drew attention to the horrific statistics at the time: approximately 44 million people currently suffering from it; a new case every four seconds; a global cost of 440 billion euros. A predicted increase to 135 million by 2050 (according to The Alzheimer’s Disease International Federation); numbers doubling every two decades (according to The World Health Organisation). The G8 pledged to find a cure by 2025. Bring it on! And this week we’ve heard more of the same here in the UK: the government’s hopes, plans and deadlines for action – increasing investment in research, developing new drugs, giving early access to medication and innovative new treatments, world-wide pooling of resources. Wouldn’t it be brilliant if people in their forties today – the prime minister, my children, their generation – loved members of families, with bright todays, and promising futures … people like Alice – could be spared the horrors of losing touch with themselves and their memories? Maybe books like Still Alice ought to be compulsory reading for anyone in a position to do something to further this aim; to remind them of the human impact of dementia. Hey, maybe we need readers’ workshops at an altogether higher level! 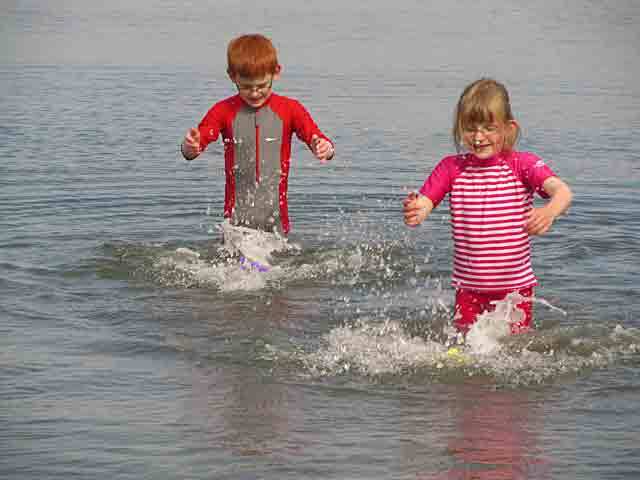 A good time to be out and about ‘on holiday’ with the children rather than indoors trying to work. Water has featured rather a lot to keep everyone’s temperature under control … animals provided a happy distraction … and some daringly fast travel generated a welcome breeze … Being in loco parentis to two of my grandchildren for a couple of weeks reminds me of how much effort goes into encouraging youngsters to be courteous, well-mannered and decent little people. We all want to be able to take them out into polite society and not be humiliated or embarrassed, don’t we? It’s not a big ask. So what would you do if one of yours make rude gestures, or shouted obscenities at complete strangers in shops? Or let out wild shrieks and blasphemy in a tranquil church? Or abused themselves in public places? What would you think of the parents if you were simply a witness to such behaviour? No, I’m not describing life chez nous this past fortnight; my own personal experience of such things is limited to that of a passing stranger. But I’ve watched documentaries on the subject, and seen something of the horror for families dealing with compulsive swearing, shouting and antisocial behaviours. Somehow though, up to now my sympathy has been largely with the parents. I couldn’t imagine ever going anywhere with a child who screamed profanities or simply had to tap a door sixteen times, twenty-nine times a day. Or did antisocial things in public places. Now, I might as well confess from the outset, that I needed to hear this message for very personal reasons. I have a very low level of tolerance for perfectly ordinary nervous tics and repetitive actions – even harmless ones like squeaking shoes, sniffing, picking spots/nail/ears, flicking the pages of a book/end of a pen … I’m not proud of this failing; but it’s inbuilt and inherited, and it’s something I’ve had to live with all my long-legged life. The endless repetition drives me nutty inside; I’ve learned for the most part not to show my irritation on the outside – I think! And hope. 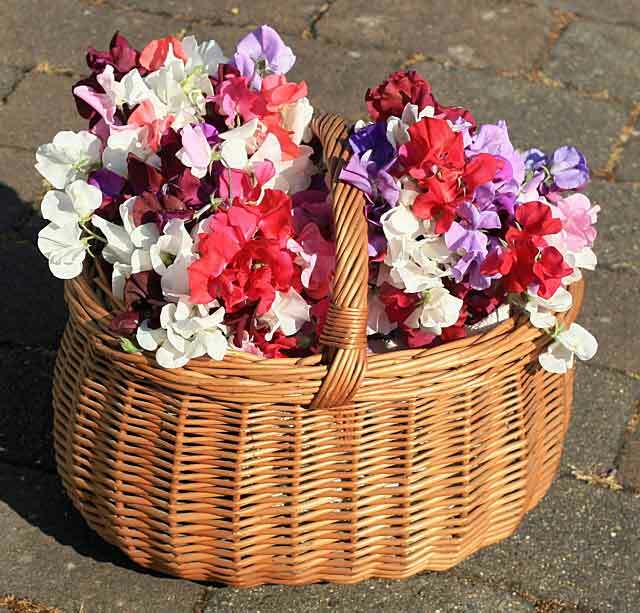 So I’m hugely admiring of the parents, nanny, teachers and fellow students, and girlfriends who managed to overlook the plethora of jerks, sounds and compulsive behaviours that James exhibits – the good and kindly ones at least. There are plenty of boys at his boarding school, similarly bound for Eton, who are merciless to the point of cruelty. And wherever he goes James himself harbours this deep sense that he doesn’t quite fit; he’s a ‘nearly person’. He repeatedly ‘fails’, adding each time to his growing sense of disappointment and rejection. He has no idea how to engage in normal social interchange with his peers; he simply can’t omit any of his rituals in order to get to a seminar on time; he finds it impossible to see past his obsession about the symmetry and rightness of words and numbers to answer exam questions. Life, Interrupted, though, gave me a better sense of the stranglehold this condition has on the person himself, the premonitory urges he has to fight every single day, the aftermath and consequences of each outburst, the impotence he feels in the face of this compulsion. James calls his nemesis ‘the Controller‘, and later ‘the Beast‘, and it’s small wonder that he seeks refuge from its pernicious influence in the two things that tame it: music and alcohol. The first soothes it, the second deadens it. James is an exceptionally gifted musician who studied flute, organ and composition at the Royal College of Music in London, but even here the Tourette’s threatened his success. 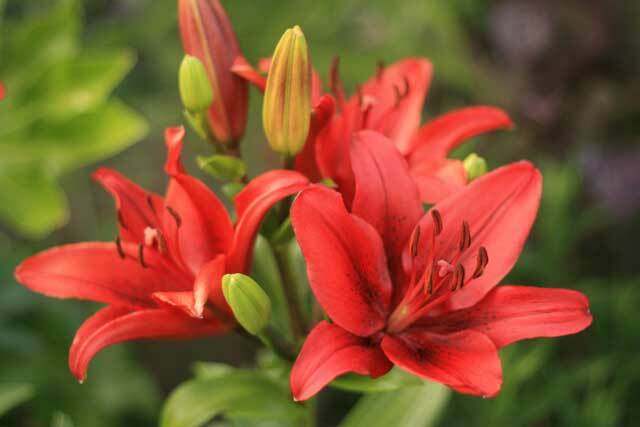 Only when he was helped to understand his condition, to give it a medical name, and to make an informed choice on its management, did he start to take proper control of his life and career. Since then he has gone on to write hundreds of scores for the theatre, musicals, documentaries and dramas. What a triumph over adversity. His nemesis has become ‘the Brat‘, much more benign and less controlling. A sobering read especially for an intolerant person like me. This one (though non-fiction) joins the list that includes Mark Haddon’s The Curious Incident of the Dog in the Nighttime, Jodi Picoult’s House Rules (featuring protagonists with autism); Lisa Genova’s Still Alice (dementia); Ben Elton’s Inconceivable (infertility), etc. All easy enjoyable reads that have helped me develop that little bit of extra sensitivity, understanding and tolerance. Which as you know, is my own aim as a novelist. Now, back to full time grandparenthood … It’s the turn of the older two children this time, and they start off with more normal temperatures. Phew! 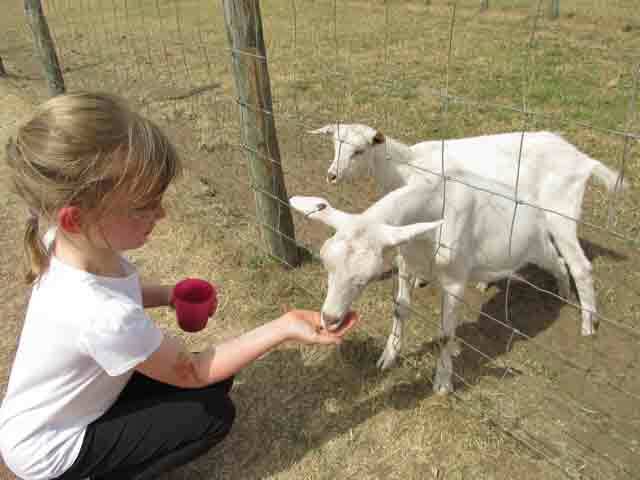 The last day of 2009 – time for a reflection or two. One of the things that has touched me greatly this year has been the messages sent by readers. I acknowledged each one individually, but I want to thank you more publicly too. Writing’s an essentially lonely occupation, and every time a new novel comes out, I get the heebie-jeebies. Is it any good? Will anyone buy it? Will anyone like it? March is fast approaching and I’m going through the same qualms with Remember Remember. Editing fiercely; hoping. Just knowing real people have read my books, engaged with the characters, and formed an opinion is heartening; the personal touch so much more meaningful than sales figures. I particularly like to hear that people have lent them to friends – a much stronger affirmation than knowing X people have bought (but not necessarily read) them … although, if my publisher’s reading this – I am promoting sales, honestly! Be more active in acknowledging literary brilliance in future. My very best wishes to you all for 2010 – whether or not you’ve contacted me! And happy reading! How’s your mental stability this week? Mine’s been seriously under scrutiny, I can tell you. It’s all this reading. And not just any old reading; almost all of it novels that feature Alzheimer’s – otherwise known as ‘the competition’. Day after day, night after night. Mammoth stints, made possible by lots of knitting. I don’t think I’ve mentioned before that I concentrate better if I knit and read simultaneously. Started when I was a kid to stop me nibbling my nails when I was absorbed in a book. So, as the pile of books has diminished, the stack of woolly beanie-hats has grown – it’s that time of year when, at our church, we fill Christmas shoeboxes for deprived children, and hats are on the list. Q1. What other novels are there out there that feature Alzheimer’s? Q2. What’s different about yours, ie. Remember Remember? My novel is due out early next year so I shot off post haste to the internet. Wowwwee! I’ve made a little list (yep, it should be sung to G&S) … 38 and still counting. I don’t know why I was surprised at the number. Alzheimer’s is so much part of life nowadays, it touches most of us in one way or another; of course authors write about it. But – cue huge sigh of relief – none of the novels so far duplicate Remember Remember’s unique selling point. Phew! So, what can I conclude to date? And have I made the right decisions for my own book on the subject? There’s still time to tweak it if necessary. a. Alzheimer’s is often quite incidental to the main story line. To tweak or not to tweak? Not. In Remember Remember, Alzheimer’s is central to the plot. And it’s told in the first person: Jessica starts unravelling her mother’s story first; Doris herself takes up the story next with her own insights and memories, moving backwards from advanced dementia through to her youth. And yep, I still think that was the right choice. Especially the backwards bit. b. The novels often take the form of family sagas. Hmmm. So does mine. Reading them one after the other probably isn’t a good idea. I’m all genealogied out! OK, maybe it’s a feature of my atrophying memory, but I must admit, delving in depth into different generations has been heavy going and confusing at times. Glimpses into different cultures, different eras, may be illuminating (Hanna’s Daughters is set against a background of Scandinavian conflicts and customs; The Bonesetter’s Daughter takes place in China), but keeping a grip on which generation we’re in and who’s influencing whom can be taxing. Especially when names are very similar: Hanna, Anna and Johanna are all principal characters in Hanna’s Daughters … I mean! To tweak or not to tweak? Probably not. From early on I was aware of the potential for losing readers so I added a family tree for Doris. I’m hoping that will help. c. Women feature heavily in these family sagas. Yeah, well they do in real life, don’t they? And they do in my book. But it was a refreshing change to have a happy homosexual son rather than a troubled married daughter as the central character in Rough Music. It would require a massive rewrite to change that. So no. But I’m quite glad now that I added a grandson, James, to give a male perspective, although, to be honest, it wasn’t deliberate at the time. He just appeared. d. We view Alzheimer’s more sympathetically when we get to know the person before the plaque set in. Often they’re portrayed as gritty little characters who’ve survived against the odds (September Starlings, Hanna’s Daughters, The Bonesetter’s Daughter, Let’s Dance). But so far the prize for most tender portrayal goes to Nicholas Spark’s, The Notebook; a cleverly plotted love story with a difference. And depicting, it must be admitted, a rather exceptional form of dementia. Both parts of Remember Remember reveal the character of Doris as a feisty, generous, open-hearted woman before holes appeared in her brain. So again, that still feels appropriate. e. People worry about the genetic implications. Will I go the same way? Is it in my genes? Genetics is a very specialised and complex subject. And too much science in a novel can be a big no-no. Early on in my metamorphosis from researcher to novelist, a helpful agent told me that I must put my ‘formidable academic background’ (his words; certainly not mine!) on one side in order to achieve a lightness of touch, so I guess I’m particularly sensitive to this hazard. The Story of Forgetting pursues a genetic theme and is awash with medical detail, but it’s partly fact, partly fiction, so it can afford to be more dense and esoteric in places. It wouldn’t be the novel you’d select if you wanted light diversion therapy, though. To tweak or not to tweak? Definitely not. Been there; done that. In my first draft of Remember Remember I wove in a plot line about inheritance of the disease, but a medical friend who’s an expert in both care of the elderly and genetics steered me away from it. Far too complicated! She was right. I was out of my comfort zone big time. So thanks to her I think I’ve avoided this potential mistake. f. A fairly universal theme is the strain on relationships. This emerges strongly from books like Shades of Grace, Animal Dreams, Almost Moon and Have the Men had Enough? Alzheimer’s isn’t exactly a fun subject and no such story would be believable without stress and tension. Love and hate get thoroughly mixed up and several characters contemplate hastening death. (I won’t spoil plots by divulging names.) But a healthy dose of family loyalty and a generous helping of humour in the mix go a long way towards preventing the story being depressing or maudlin. Who could fail to be amused by Uncle Rollie in Diminished Capacity, who baits hooks connected to the keys of an old typewriter by the side of the Mississippi, so that the local fish can write poetry? For a number of years now I’ve spent time with people with dementia on a regular basis; I would never consciously belittle or ridicule them, but dividing lines can be extremely fine. I’ve tried to be sensitive in my attempts to keep a light touch but just to check I’ve got the balance right, I’ve given the manuscript to a number of people who know exactly what it feels like. So far nobody’s crossed me off their Christmas list. g. Dementia in the family throws up lots of issues. ‘Issue-books’ in the wrong hands can be tedious and off-putting; most of us don’t turn to novels to be preached at. I’m studying this minor mountain of books to see how other authors handle the thorny issues of who cares, when mental competence is lost, how far we can or should go in safeguarding safety and dignity, etc. No consensus as far as I can see … except that these are real issues, and they’re decidedly thorny. Let’s Dance and September Starlings get deeper than most into these questions – Laura Starling even contemplates euthanasia for her beloved husband. My unique selling point relates to this matter of issues, more specifically the ethical challenges. But hey, I want you to read the book so I’m not going to introduce any spoilers in my blog! Now, which book next? And where are my size 11 needles? Would whoever has put a hex on our household please, please, remove it. I don’t know what I’ve done to offend you, but I promise I won’t do it again. 4. phone (landline) dies. First engineer sent to site on Day 2, foreign to neighbourhood, can’t track lines, defers problem. I read a terrific book in the midst of the chaos listed above. Still Alice by Lisa Genova. Alice has dementia; it’s her story. I’m glad my own novel on the subject is written or I’d be tempted not to write it, because Still Alice fits almost all my own criteria. I entered her world … I found myself testing my memory with mental lists … I could almost believe the phone, the tree, the car-key, were a figment of my dementing mind … what a relief to find all those annoying things really had happened. Well, they do say, truth is stranger than fiction. Speaking of which, I must get down to writing it. Much catching up to do after a frustratingly hamstrung week.